Turquoise looks so cute on all little boys and who wouldn’t love a train set? 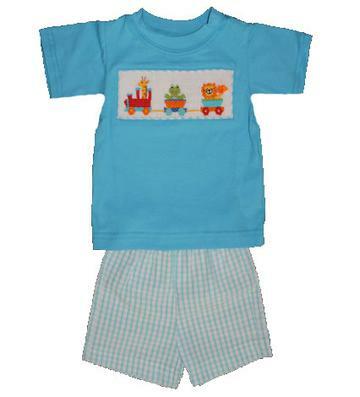 The turquoise shortsleeve shirt has a train and animals smocked on the chest with a turquoise and white gingham trim around the smocking. There is matching turquoise and white gingham shorts with an elastic waist. These shorts are above the knee and super comfortable. This adorable outfit is 100% cotton.